To install the plugin bundle on your system, simply copy the synthpod folder out of the platform folder of the downloaded package into your LV2 path. Synthpod is an LV2 host. It can be run as a standalone app and be used as a tool for live performances or general audio and event filtering. It was conceptualized to fill the gap between pure textual (e.g. 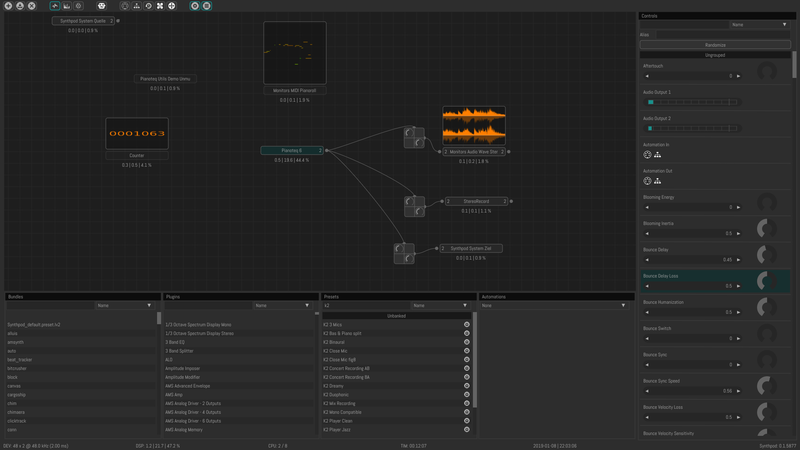 SuperCollider) and pure visual flow (e.g. Pure Data) audio programming paradigms. It may be run on top of an audio system (JACK or ALSA) and on top of an event system (MIDI and OSC). It can be run with a GUI or headless. You can e.g. prepare a patch on your desktop machine and then transfer it to a wearable synth. Synthpod takes a totally modular approach whereby it provides only the minimal necessary host infrastructure expected by a given plugin. All additional, non strictly necessary glue shall be implemented with plugins. Synthpod e.g. can be extended with OSC via Eteroj. Sequencing and looping may be added via plugins from the Orbit bundle. When paired with realtime scripting via Moony, it turns Synthpod into a versatile realtime programmable, remote controllable LV2 host framework. As Synthpod tries to be a lightweight LV2 host, it may not (fully) support the more exotic extensions. Get an up-to-date overview of current extensions support for Synthpod in the table below. The full LV2 specification is located at http://lv2plug.in/ns/. Synthpod as host built on top of JACK with support for native JACK audio, MIDI, OSC and CV in/out ports. The right choice on GNU/Linux for modular setups. This standalone host supports NON session management and JACK session management to neatly integrate into modular setups. Synthpod as host built on top of ALSA with support for native ALSA audio and MIDI sequencer in/out ports. The right choice on GNU/Linux for live setups, embedded devices or when you don’t need audio routing to other apps. This standalone host supports NON session management to neatly integrate into modular setups. Synthpod as host built on top of a dummy driver, mainly useful for debugging purposes. Convert between Control Voltage and control ports. Just burn CPU cycles away for debugging. A rudimentary graphical keyboard with a 2 octave range, mainly meant for simple test cases. Split MIDI events based on their channel. Silence MIDI downstream plugins upon panic. The Synthpod LV2 non-linear plugin container run as a plugin itself in an other host or itself. It features stereo audio in/out ports, atom event in/out ports and 4 control in/out ports. Use this to add support for non-linear plugin routing in a strictly linear host. Synthpod comes as server - client combo, e.g. the server doing the DSP side of things runs in its own process and the client showing the GUI side of things runs in its own process. By default, synthpod just runs the server. There’s a command line argument to automatically run the GUI, if you want. Please consult the manual page to find out more.